with Yuri Bashmet, premiere of "Surgite Gloriae"
with Yo-Yo Ma, after the premiere of "morning scent of acacias' song"
Equally enthralling is Sharafyan's arrangement of Komitas's Krunk (Crane) for duduk, piano and cello. As in the Suite, tonally conventional elements co-exist with the oscillating pitches and clusters of Sharafyan's harmonic language to magical effect. .... And all of the string players confidently handled unconventional intonation in Mr. Sharafyan’s “Adumbrations of the Peacock,” a stark, mysterious and ultimately majestic concatenation of broken-bell piano chords, tremulous melodies and quivering textures. Vache Sharafyan's "Sinfonia No. 2 un poco concertante," a BMOP commission and world premiere, takes that essence as its starting point. Melodies erupt into dense, slow-shifting harmonic clouds; a repetitive figure builds into crashing waves of multitudinous, Ivesian dissonance. A solo duduk, the Armenian folk oboe (pre-recorded for this concert), spins periodic arabesques, the instrument's microtonal inflections transmuted in the orchestra. Sharafyan creates complex, deliberate, ultimately captivating grandeur - artistic director Gil Rose led a terrific, vivid performance. ..."But the most wonderful piece on the program was "The Sun, the Wine, and the Wind of Time" (1998) by the Armenian composer Vache Sharafyan. The score derived much of its ineffable sadness from the duduk, an oboe-like instrument whose quivery, throaty sounds were framed by piano (Joel Fan), violin (Colin Jacobsen) and cello (Yo-Yo Ma). The seamless evolution of moods and textures—from soft, somber lines made up of pained intervals, to more violent outbursts, back to mournful lines—made it entirely absorbing to the ear and mind..."
Vache Sharafyan’s "The Four Seasons" was the significant world premiere, including Armenian poetry as a prelude to each of the four movements… Sharafyan’s language includes remarkable solo writing ... The composer is not afraid of dissonance, and the furious intensity he achieves serves clear narrative intent, including real satisfaction. "The Four Seasons" required extra performers, including the first Pittsburgh residents to play with the group this season: violist Paul Silver and bassist John Moore from the Pittsburgh Symphony Orchestra and percussionist P.J. Gatch. In the second half, the penultimate work by Vache Sharafyan had such an intensely spiritual quality, one could almost imagine the Hilliards wearing robes and living in a closed order while singing their sublime music. One of the major composers in Armenia, but also internationally Vache Sharafyan is the author of more than ninety compositions including symphonic works, chamber music, choral, vocal music including the opera "King Abgar", and ballet "Second Moon". Sharafyan's music is widely performed in his native country but also in the most prestigious international halls in USA, Italy, Israel, Russia France Canada, Ukraine, Georgia, Germany, Austria, Belgium, Holland, Thailand, Lebanon, Hungary, Switzerland, Spain, Taiwan, Japan, Scotland, Mexico, Poland, Ireland, England, Iceland, Latvia, Greece, Cyprus, Poland and Sweden. It is also invited many contemporary music festivals whether in the US or Europe. Praised as " stark, mysterious and ultimately majestic " by The New York Times, " complex, deliberate, ultimately captivating " by Boston Globe, " ingenious... , kaleidoscope of iridescent timbres..., magical " by The Strad, "fascinating and expressive" by David Harringtone /Kronos Quartet/, the works of Sharafyan were commissioned - performed by outstanding musicians such as Yo- Yo Ma and "Silk Road Ensemble", Yuri Bashmet and The Ensemble "Soloists of Moscow", Anne Akiko Meyers, The Hilliard Ensemble, Boston Moderen Orchestra Project and Gil Rose, Suren Bagratuni, Mario Brunello, Movses Pogossian, George Pehlivanian, Dresdner Sinfoniker, Andrea Molino, Premil Petrovic, OSS, Karen Durgaryan, Mansfield Symphony, Rostok Philharmonics, Thuringer Symphony, SDG Psalm project, NCOA, APO & Eduard Topchjan, Alexander Chaushian, Sion Festival to mention a very few. Vache Sharafyan was born in 1966 in Yerevan (Armenia). 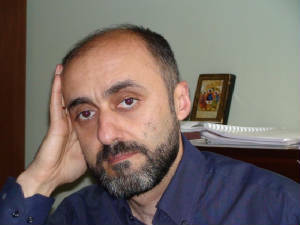 A graduate of the Conservatory of Yerevan in 1990, in 1992 he obtained a doctorate in composition in the class of Professor Edvard Mirzoyan. From 1992 to 1996 he taught at the Armenian Theological Seminary in Jerusalem and is the author of a book on sacred hymns for the Church Holy Sepulchre in Jérusalem. 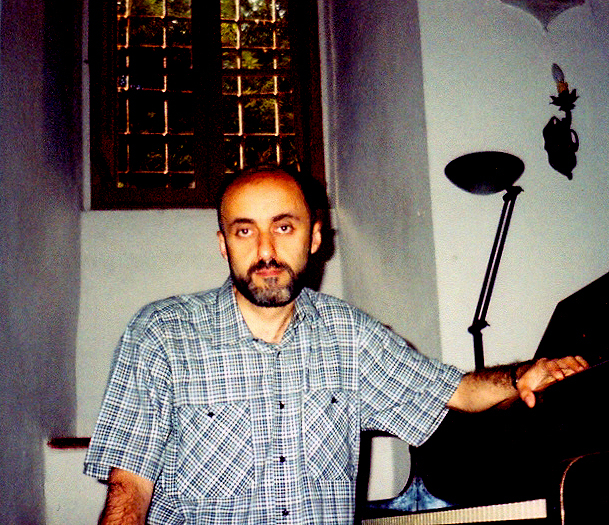 In 1992-96 as a Professor of music theory and sacred music Vache Sharafyan worked in Jerusalem Theological Armenian Seminary (Israel). Authored a Book of Chants for Holy Sepulchre Church, Jerusalem. As an official composer for the renowned Silk Road Project since 2001, Sharafyan's compositions ”The Sun, the Wine and the Wind of Time” and “The Morning Scent of the Acacia’s Song” were performed by cellist Yo-Yo Ma and the Silk Road Ensemble in Cologne Philharmonie, Brussels Philharmonie, Amsterdam’s Concertgebow, in USA: Carnegie (Stern ) Hall, Carnegie (Zankel) Hall, Berkeley University, Stanford University, Seattle/ Benaroya Hall/, Washington National Mall, Chicago Symphony Orchestra Hall, in Italy: Rome, Florence, Milan., and other venues in USA and Europe. “Sinfonia 2 un poco Concertante” was commissioned by Boston Modern Orchestra Project, cond. Gil Rose and premiered in 2008 at Jordan Hall. Sharafyan is author of opera “King Abgar”, ballet “Another Moon”, a number of chambers, symphonic, choral, vocal compositions, which were commissioned/performed/recorded worldwide by Hilliard Ensemble, Metropolitan Artists in Concert, Anne Akiko Meyers, Avalon quartet, “Soli Deo Gloria”, MATA Ensemble (New York), Amsterdam Atlas Ensemble (Ed Spanjaard), Orchestra Sinfonica Siciliana, Tony Arnold, Theo Bleckmann, Daniel Plaster, Scott Ramsay, Carl Thiemt, Artsvik Demurchyan, Jamila Raimbekova, HOVER State Chamber choir, Irkutsk Philharmonic Orchestra (Ilmar Lapinsch), Mansfield Symphony (Robert Franz), APO (Eduard Topchjan), George Pehlivanian, NCOA (Emin Khachatutyan, Aram Gharabekian, Vahan Mardirossian), Movses Pogossian, Colin Jacobsen, Guillaume Sutre, Varty Manouelian, Johnny Gandelsman, Tigran Maytesian, Pavel Vernikov, Maria Safaryants, Suren Bagratuni, Alexander Chaushian, Mario Brunello, Peter Stumpf, Erik Jacobsen, Boris Andrianov, Peter Bruns, Aram Talalyan, Marta Bagratuni, Stephen Prutsmann, Andrew Armstrong, Joel Fan, Eric Stumacher, Ksenia Bashmet, Deborah Moriarty, Artur Avanesov, James Houlik, John Sampen, James Forger, Nicolas Cords, Nils Moenkemeyer, Matthias Worm, Yuri Gandelsman, Gevorg Dabaghyan, Araik Bartikyan, Emmanuel Hovhannisyan, Jivan Gasparyan, Jivan Gasaryan junior , Maxim Novikov, Andy Miles, Zerafin ensemble (Amsterdam), Kunico Kato, Apple Hill Chamber Players, PNME (cond. Kevin Noe, Robin Fountain), Atanassov Trio (France), Baird Trio, Pittsburg Trio, Khachaturyan trio, Dilijan Chamber Music series /LA/, Fugata Quintet /London/, Quintette à vent de Marseille, Dresdner Sinfoniker, cond. Andrea Molino, Petersburg Academic Philharmonic orchestra, Federico Mondelci, Rostok Philharmonic symphony orchestra and choir, Thuringer Simphony /Oliver Weder/, KU Leuven, Sion Festival among many others. 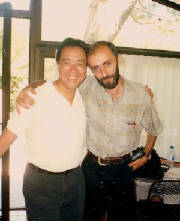 Sharafyan’s compositions were performed in the most prestigious venues in Armenia, USA, Italy, Israel, Russia, France, Canada, Ukraine, Georgia, Germany, Austria, Belgium, Holland, Thailand, Lebanon, Hungary, Switzerland, Spain, Taiwan, Japan, Scotland, Mexico, Poland, Ireland, England, Iceland, Latvia, Greece, Cyprus, Poland and Sweden. Nominated to "Civitella Ranieri Fellowship" in 2006, Italy. Guest professor on Armenian music studies at University of California Los Angeles (UCLA) for one semester in 2011. Viola Concerto “Surgite Gloriae” with duduk, discant, baritone, and orchestra (French horn, bell, strings) with Yuri Bashmet and ensemble "Moscow Soloists" (cond. R. Balashov) at Elba Isola Musicale Festival on September 4, as well as in Moscow Conservatory Grand Hall philharmonics seasson opening on September 19. "Folk tunes arrangements & transcriptions by Komitas" played by NCOA and G. Dabaghayn at Thearte du Chatelet in Paris (cond. A. Gharabekian) . "Sinfonia 2 un poco Concertante" with Boston Modern Orchestra Project, cond. Gil Rose on May 23 at Jordan Hall in Boston (Meet the Composer). Cello Concerto with string orchestra with Suren Bagratuni and NCOA (cond. A.Gharabekian) at Komitas Chamber Music hall in Yerevan on May 31.
recording of “Lacrymosa” for solo cello, descant, soprano, mix choir and symphony orchestra for the movie “Maestro” (prod. 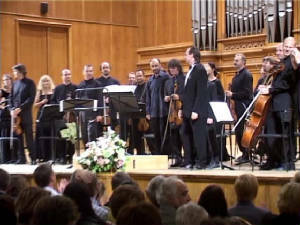 Vigen Chaldranyan) with the Armenian Philharmonic Orchestra & “Hover” choir (cond. Edward Topchjan) on October 26. "Canticum Dolorosum et Pacificum" for soprano, mix choir and orchestra (trumpet, bass drum, piano, strings) with Artsvik Demurchyan, Hover choir, Serenade chamber orchestra, APO soloists cond. Eduard Topchjan on June 2 (Chamber Music Hall after Komitas). "Once in a beautiful meadow" for ensemble Zerafin, Amsterdam. "Light-drop peals" version for clarinet and viola, Maxim Novikov & Andy Miles, Reinickend.-E.Reuter-Saal, Berlin.